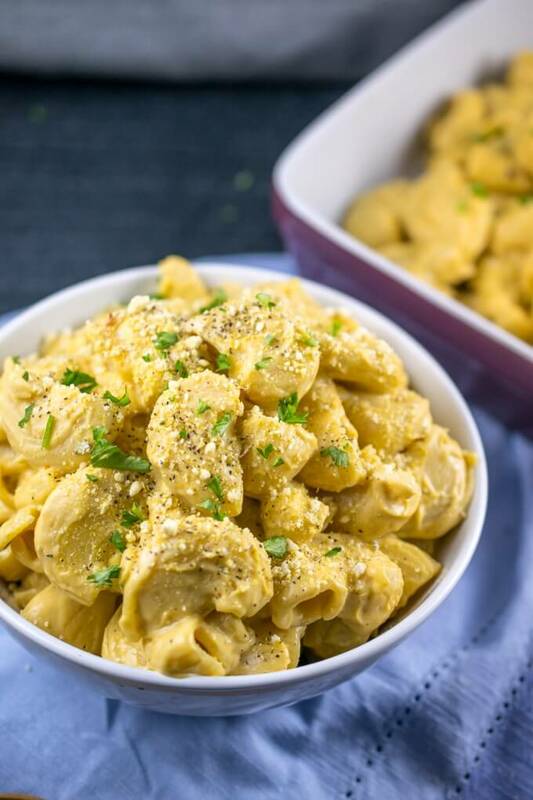 One of the fun things about vegan “mac and cheese” is that because it’s already such a departure from the original dish, you can put lots of different spins on it with different base ingredients in the sauce. Today I have a dairy-free cauliflower mac and cheese with a base of creamy pureed cauliflower and cashew. The cauliflower makes this somehow both rich and light at the same time; and the recipe is pretty easy to make! 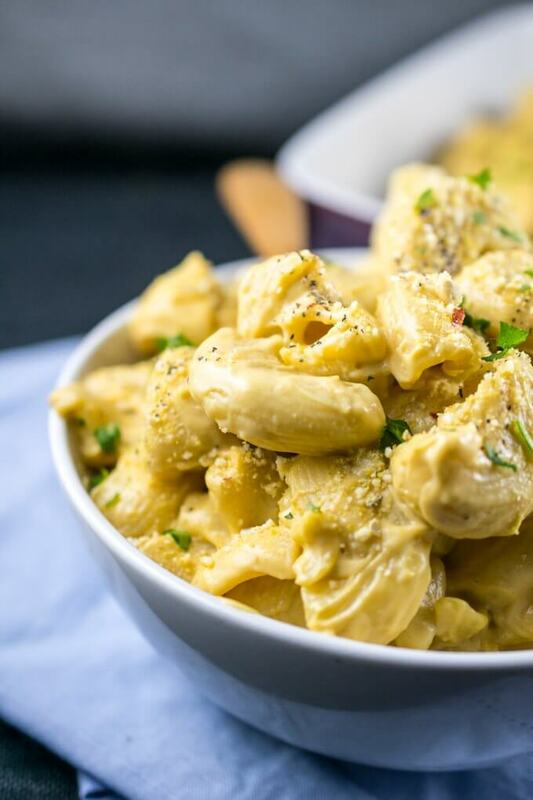 This plant-based mac comes via the America’s Test Kitchen Vegan for Everybody cookbook. I got a copy for Christmas and there are a lot of solid recipes in it. Clearly a lot of research and testing went into the book, and I think the result is a really great collection of recipes! I made the quiche recipe for a non-vegan crowd and it was very well-received, living up to the cookbook’s name. Reduced the fat content (I scaled down both the oil and the cashews). Reduced the quantity of nutritional yeast. Added miso (it’s my number one ingredient for creating cheezy flavor). Tweaked other flavors here and there. I’m happy I could make things just a liiiitle more nutritionally balanced while equally delicious! This could also easily be made with whole grain, gluten-free or legume-based pasta to meet any health or dietary needs that you have, since unlike with my one pot pastas, the pasta composition isn’t very important to the texture of the dish. This is your periodic reminder that cauliflower mac and cheese, or any vegan mac & cheese for that matter, does not taste exactly the same as the “real thing”. The texture is creamy and a little bit melt-in-your-mouth, and there is a balanced, slightly tangy savory flavor, but no it is not the exact same flavor as dairy cheese. I think the important part, though, is that it’s just really umami and delicious. I tested this recipe with almond milk and my favorite plain soy milk and I think they are equally here. The soy milk version is slightly creamier and also a little bit higher in protein. I could see rice milk being good too if you reduced the amount a little bit. I don’t think I’d recommend other varieties of non-dairy milk aside from those to the uninitiated, but if you have a favorite, go ahead and use it! (Oh, and whatever you do, don’t use coconut milk. 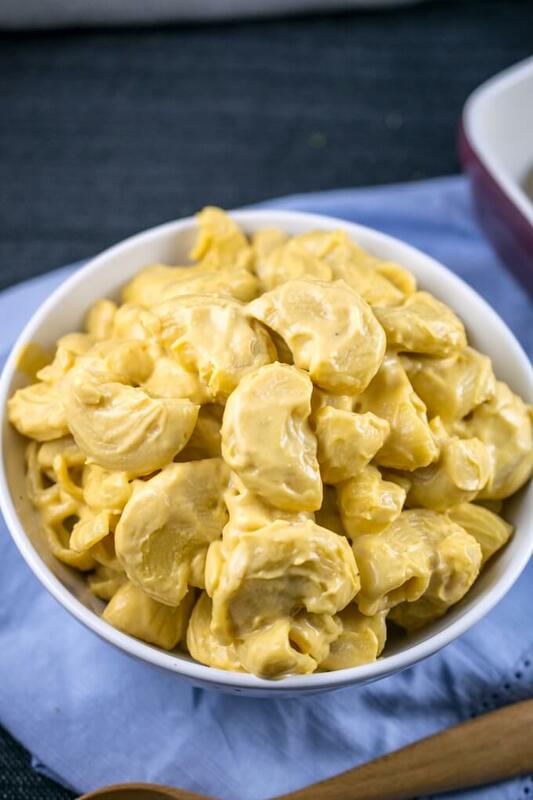 A strong coconut flavor in vegan mac and cheese is well… just please don’t do it. Be sure to use refined coconut oil for this same reason). Heat the oil in a large saucepan over medium heat until shimmering. If using the optional shallot, add it and stir, cooking until slightly softened, about 3-4 minutes. Add the nutritional yeast, mustard, turmeric, tomato paste, garlic, and salt. Stir and cook for about 45 seconds, or until fragrant. Add the almond milk, scraping the bottom of the pan as you stir it in. Bring to a steady simmer. Add the mixture to your blender (working in batches if needed; I divide this in half to use in my Ninja) and blend until completely smooth. If you don't have a high-powered blender this may take a few minutes to break down the cashews. Stop to scrape down the sides as needed. Set aside when done. Meanwhile, cook your pasta in a pot of generously-salted water. Cook until al dente, according to package instructions. Reserve 1/2 cup of the pasta cooking water, then drain the pasta (but do not rinse it), leaving it in the strainer. Add the pureed cauliflower mac and cheese sauce to the pot, and turn the heat to medium low. Cook, stirring frequently, until gently simmering. Stir in the cooked pasta, the white vinegar, and a splash of the pasta water. Continue to cook until the sauce is slightly thickened onto the pasta. Add more of the pasta water to thin out the sauce as needed. Season to taste with additional salt and pepper and serve immediately. The leftovers from this vegan mac and cheese taste good, but it's definitely far better when fresh! I find that the leftovers just need a little additional salt and vinegar or hot sauce added because the pasta absorbs a little bit of the flavor when it sits. GRAIN-FREE: Chickpea-based or lentil-based pastas are sometimes available in my area or online. If you use them, don't add any reserved pasta water to the sauce. NUT-FREE or NO CASHEWS: This might work with sunflower seeds instead of the cashews. Use 1/2 cup. There will be a mild sunflower flavor. I have not yet tested this substitution. Use soy milk instead of the almond milk. If you don't need nut-free, macadamia nuts work instead of cashews too. If you desire a baked version, rinse the pasta before mixing it with the reserved pasta liquid and sauce, and then put the whole vegan mac and cheese dish in the oven at 350 topped with breadcrumbs and oil until crispy. 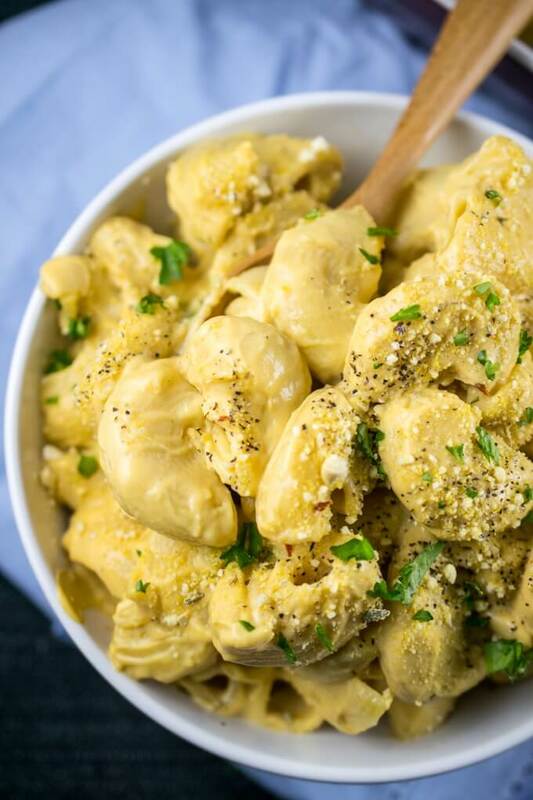 Folks who are a fan of potato carrot cheese are encouraged to add potatoes and carrots to this in place of some of the cashews to make a lower fat vegan mac. This is hands down the best vegan mac and cheese that I’ve tried and I love that it’s somewhat healthy too! Thanks Shannon! Could I omit the oil? Thanks! I haven’t tested this without oil so I’m not sure, I did have at least one other comment from someone who omitted it and still enjoyed the result, I suspect if you are used to eating oil-free cooking that you would like it too but otherwise I may not recommend it. This is the best vegan Mac & Cheese I’ve ever made! Thank you for creating this amazing recipe! It’s super delicious! That’s wonderful to hear, Sara! Thanks for leaving a comment. Question: are there shallots in the recipe? The video has them but I don’t see them listed in the written recipe. Great catch 😀 they aren’t in the original recipe, but sometimes I throw them in when I have them around. I’ll add a note to the recipe that they can be optionally included. This looks so great and I’m going to make it tomorrow. One question, why the vinegar? Undecided if I should add it or not.. The vinegar is definitely needed! It provides tanginess to balance out the flavor profile rich and creamy ingredients. I often add even more to taste than the recipe states. Can I make ahead and freeze? Have you tried that? The sauce from this recipe would freeze well. I wouldn’t recommend freezing the pasta and sauce together. I made this and loved it! My family didn’t even know it was vegan. Thank you the amazing recipe! Hi Susan, any light colored (like white or yellow) miso paste should work. Natural stores, Asian supermarkets, and (these days, depending on your location) some regular grocery stores should have it in the refrigerated section. It can also be ordered online (I added an Amazon Fresh link to the ingredients list). Hope this helps! Pre-soaking your cashews or substituting raw cashew butter might help if you don’t have a blender! This is amazing and I don’t even like cauliflower. The second time I made this I used only half the amount of pasta and reserved the rest of the sauce. The sauce reheated pretty well and was poured over veggies throughout the week – great departure from plain veggies! This was absolutely incredible. I added pickled jalapenos to ours because I wanted a spicy mac. 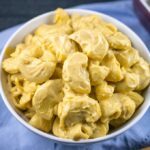 This is the best vegan mac and cheese I have tried yet! Thanks for sharing your experience! I’m glad to know that it’s kid-approved as well. Could you omit the nutritional yeast? (1) Increase the miso, and use a dark miso if you have one. (2) Add an onion, chopped, and cooked in the oil until soft, before adding the garlic et al. These modifications would recover some of the savory flavor lost from omitting the nootch. Just made this, my FIL forwarded it to me 🙂 Was delicious! (and sooo easy!) I already had everything in the house, even better… perfect with the snow falling outside. Thanks! Made this today. The sauce is so good!!! This looks amazing! Can I use white beans instead of the cashews do you think? Hi Sylvia! White beans are pretty different from cashews so I’m not quite sure whether this would work. You might need to increase the oil to make up for the lost richness and creaminess from removing the nuts. I do have a creamy white bean pasta sauce on the blog here that’s quite tasty but I’m not sure I’d say it’s “mac and cheese” levels of creamy.